The global graphene composites market depicts a consolidated and competitive landscape, thanks to a rise of large players who hold a significant share. Graphene composites are witnessing a rising demand in high-end industry applications, reports Transparency Market Research (TMR). This is expected to smoothen entry of new players in the market as innovation in on the rise in the grapheme composites market, adds TMR. Additionally, key players in the market are also witnessing higher profit margins due to new applications. Some of the key players in the global graphene composites market are Graphene NanoXplore Inc., Graphene Industries PLC, Applied Graphene Materials p, and Nanochem plc. Thanks to a large number of growing applications, the global graphene composites market players offer products for various uses and sectors. These include electronics, semiconductors, energy, optoelectronics, composites, aerospace and defense, inks, coatings, and automotive. The graphene composites market is witnessing a multi-fold rise in output, thanks to growing demand. According to a report by American Chemical Society, its output has increased by over 5 times during 2010-2017. Manufacturing in Asia Pacific region, mainly in India and China is playing a major role in the increase in output. Despite joining the race quite late, graphene composites market players in China have registered over 60% patents since 2010. According to a new TMR report, the graphene composites market is expected to register a 40% CAGR during 2017 and 2026. The market evaluation stood at US$ 6.3 mn in 2017. It is expected to register a mind-boggling growth during the forecast period, thanks to rising demand from the electronics industry. Asia Pacific region is expected to gross the highest share of the total revenues during the forecast period. The graphene composites market is benefitted by increased influx of government and private funding in research and development. The increased focus on research and development is leading to significant benefits for the players in the graphene composites market. For example, recently Linglong Tire, and Beijing University of Chemical Technology collaborated to create graphene rubber composites for tires. According to the company report, the tires are expected to be extremely fuel-efficient and are likely to qualify for A grade in fuel efficiency under EU labeling protocol. Similar breakthroughs are also being seen in other industries such as chemical vapor deposition (CVD). It is used in the application of copper and nickel substrates. Graphene makes copper as much as 500 times stronger and nickel by 180 times. Growing research in the field is making way towards lighter and far stronger end-products. This is expected to drive significant growth for the graphene composites market as lighter airplanes in the aviation sector can result in significant fuel-savings for end-users. Global demand for vehicles is rising at a robust pace. Growing demand in emerging countries is expected to fuel this demand further. Additionally, some graphene composites are known to possess excellent mechanical reinforcement properties, especially useful in vehicle manufacturing. For example, recently Ford introduced a small tweak in its manufacturing technique with a use of 0.5% graphene. This small improvement is expected to result in substantial increase in heat endurance, and reduction in noise. Additionally, graphene composites market players are focusing on futuristic opportunities such as building of extremely strong military vehicles. Graphene is known to be far stronger than Steel, sometimes by 200 times. Additionally, graphene based-tired are already making their mark by boosting performance, fuel efficiency, wet grip, and durability. 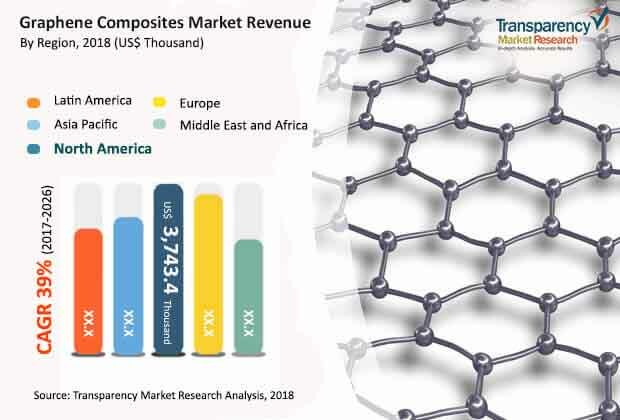 The review is based on TMR’s report titled “Graphene Composites Market (Product Type - Polymer based Graphene Composites, Ceramic based Graphene Composites, Metal based Graphene Composites, Others (Cement, Carbon Fillers, etc. ); End use Industry - Electronics, Building and Construction, Aerospace, Automotive, Aerospace, Energy Storage and Generation, Others - Textiles, Paints and Coatings, Health Care Devices) - Global Industry Analysis, Size, Share, Growth, Trends, and Forecast 2017 – 2026”.